Having recently prepared a new car for towing, I wanted an opportunity for a short tow and a few days in the caravan. I decided on the 70 mile drive from home down the M20 to the Caravan Club’s Blackhorse Farm near Folkestone. 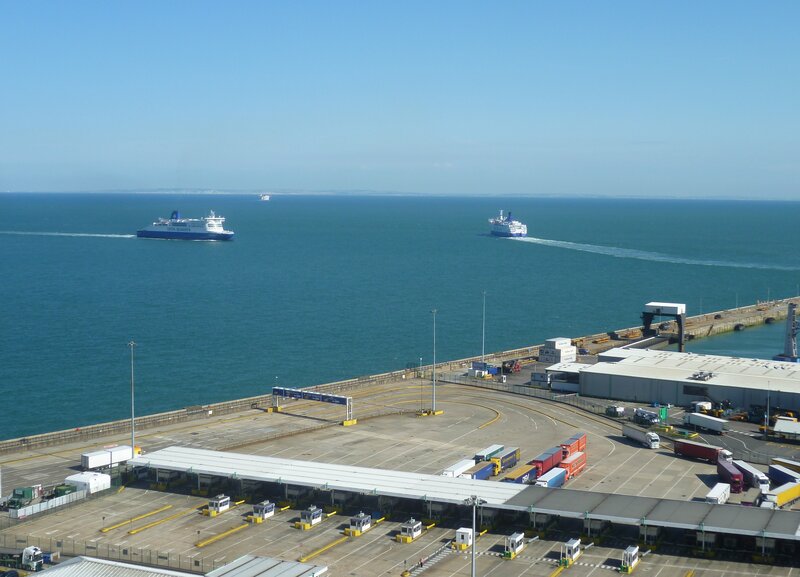 Being close to the Tunnel and also to Dover, the site is very popular with caravanners looking for a night’s stop before or after crossing to France. But for a longer stay it’s a delightfully quiet site with easy access from motorways and main roads. 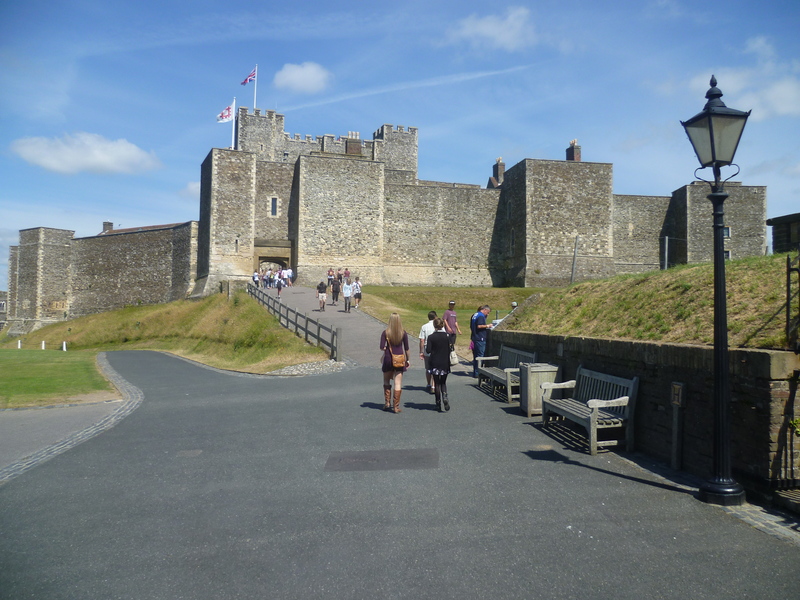 It’s also well placed for visiting Dover Castle and Canterbury. 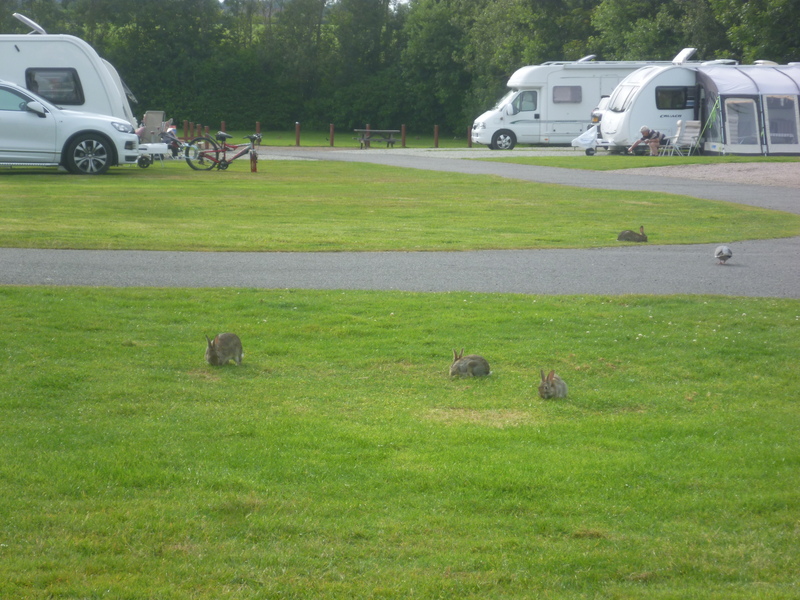 There’s no black horse to be seen on the site, but what you will see are rabbits. There are hundreds of them, all contentedly chewing the grass and not being too concerned about traffic and people. I arrived in the early afternoon so I quickly pitched the caravan then set off to spend some time around Dover. Tom-tom confidently navigated me up the road past the castle to the cliff top car parks. 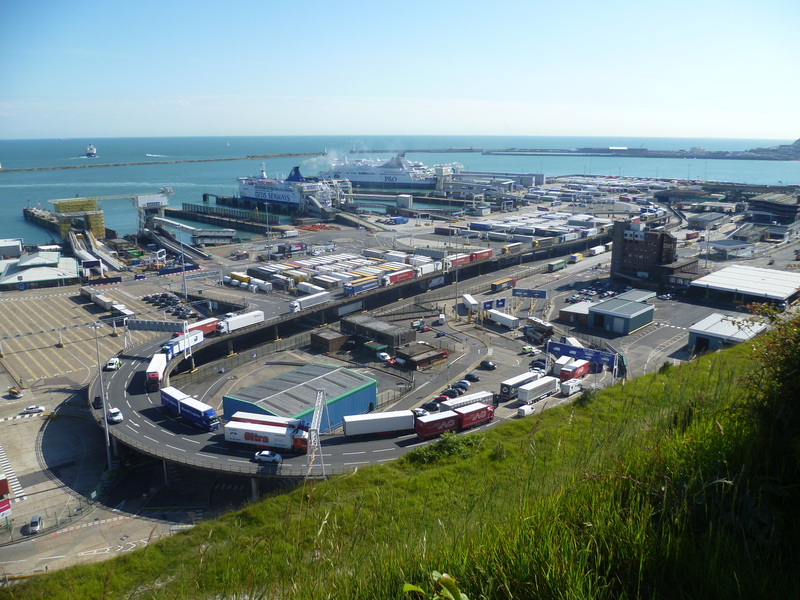 Since the days of Townsend Thoresen I’ve been passing through the Port of Dover three or four times each year, but not until last week have I stood on the top of the White Cliffs and looked down on the scene below. It’s only when you have the sea-gulls view of the Port do you realize what a hive of activity it is. With the almost perfect weather conditions the cliffs of Le Cap Blanc Nez could clearly be seen across the Channel. 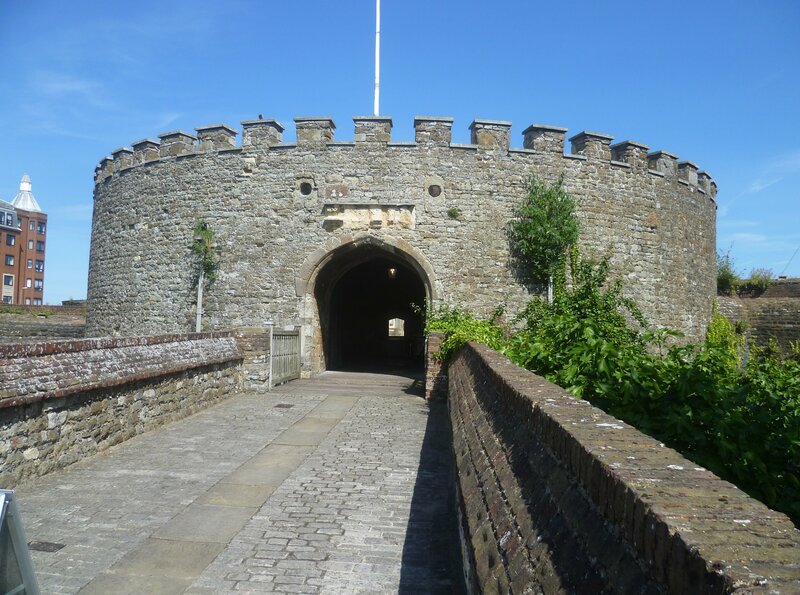 Tuesday – A beautiful day so lunch and a flask is packed into the car and I do the short drive into Dover. I’m first in the queue of cars waiting to drive up the hill into the car parks. Admission price for each adult is a hefty £17.50 but my EH membership card gets me in free. Long before Henry II started building a stone castle, the hill had been used as an Iron Age hill fort. Later the Romans built a lighthouse, the remains of which are still standing. It was to the Pharos and the Saxon church that I first went. Later I walked around the ramparts before dropping down to enter the courtyard. It’s a strenuous climb to the top of the keep but fortunately there are several floors to visit so it makes a break in the stair climbing. 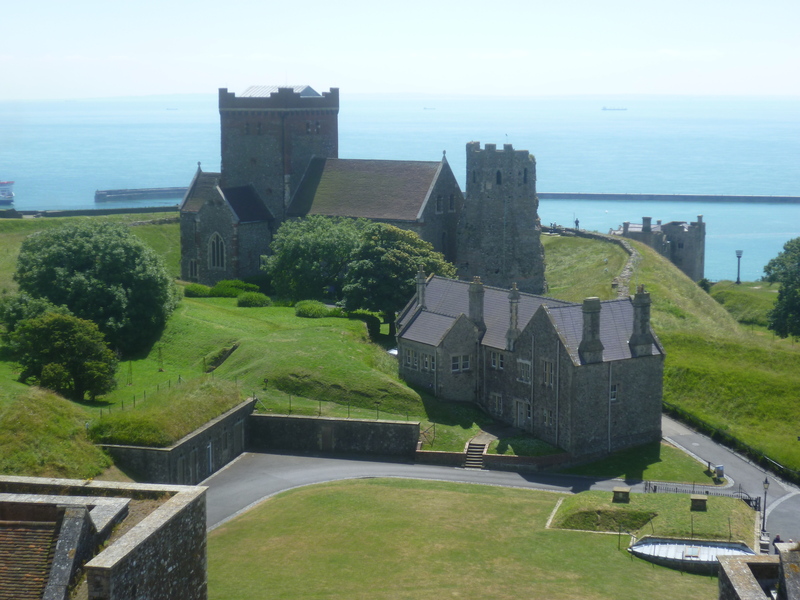 Once on the roof of the keep, the views across the countryside and the Straits of Dover are superb. There is much to see at the Castle but I wanted to move on to my next venue, so I left the wartime tunnels and the World War II control rooms for another time. 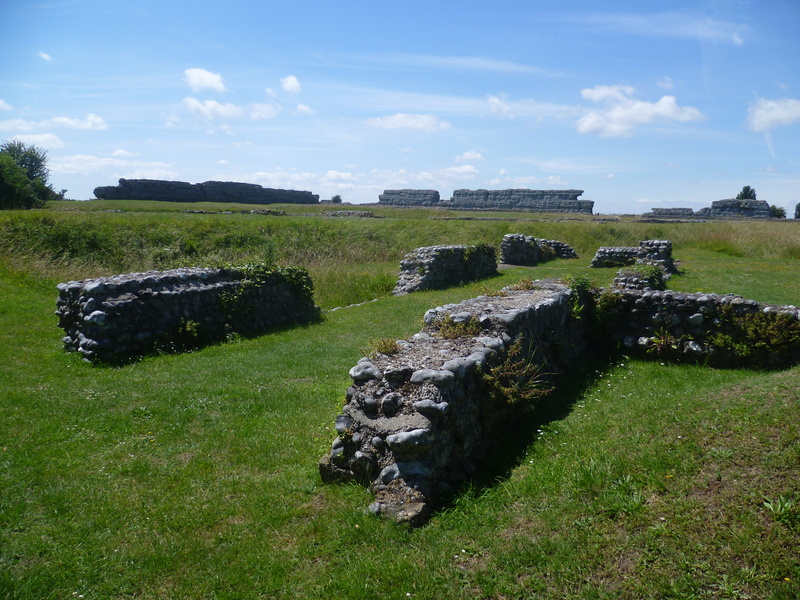 After so much activity I was glad to get back into the car and drive the 15 miles to the ruins of Richborough Roman Fort. First thing on arrival was to get out an easy chair, then have some lunch and a beer before more walking. Although these remains now stand in the middle of a field, when the Romans built it, it was one of a series of Shore forts which all stood close to the shoreline. This one was built as a supply base shortly after the invasion of 43AD. Since that time the rivers have silted up and the marshes have become land. Hence the Isle of Thanet is no longer an island. 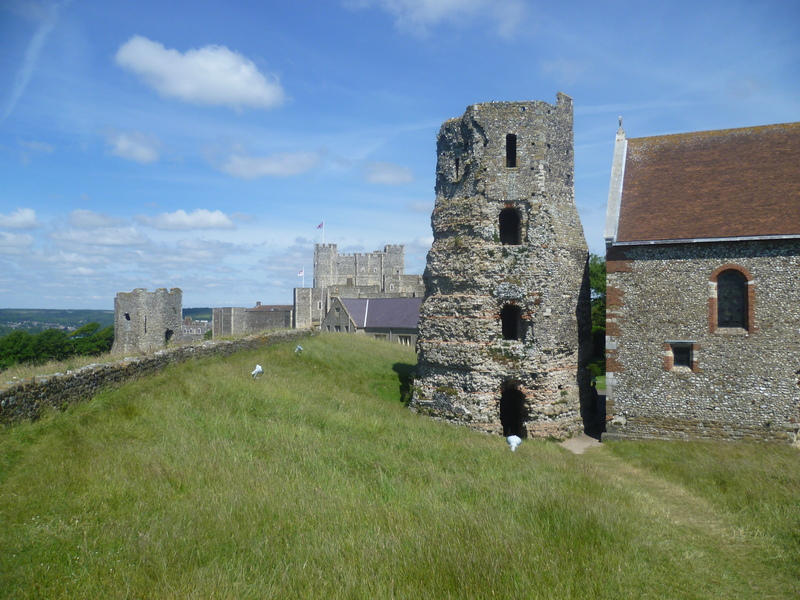 From Richborough I drove the car across to the coast to have a look at Henry VIII’s Castle at Deal. This is a round Castle, one of a series built in case of European invasion. 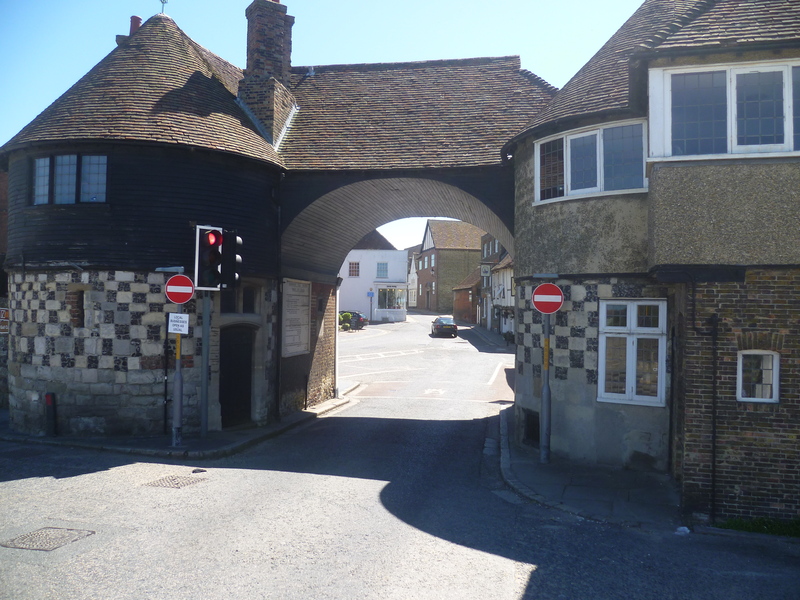 From there, I drove along the coast stopping in the lovely seaside town of Sandwich. Parking was difficult so I parked along the river then took to my bike. 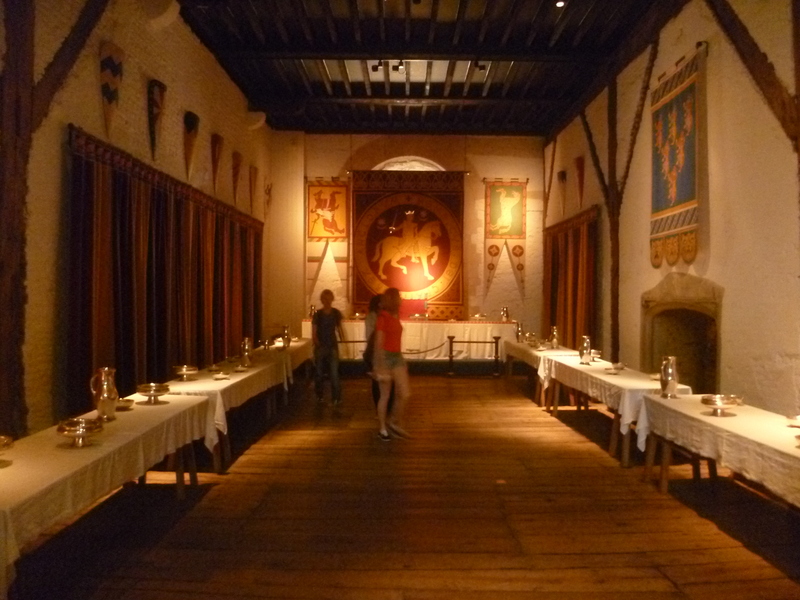 Wednesday – Today I packed lunch and drove to Canterbury. Since it was only 20 miles, I was there early enough to find a parking place close to the city wall. I left the car and walked through the town to the Cathedral precincts – but only to find the Cathedral would be closed until mid-afternoon. It was Founders’ Day for the Cathedral School. 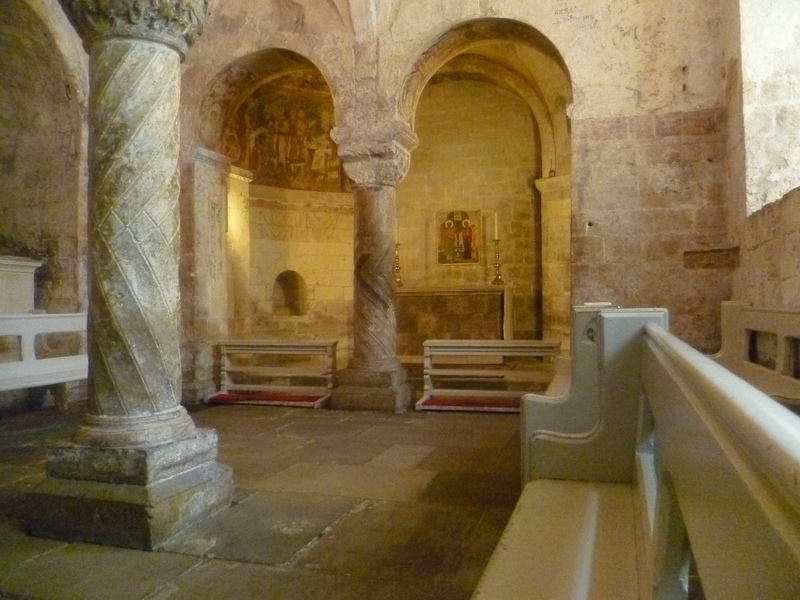 Fortunately there was still access to the cloisters and the crypt. And it was interesting to see the scholars and staff on their way into the Cathedral. I got back to my car just as my 2 hour ticket expired. I then drove north for another 20 miles to bring me to Reculver on the North Kent coast. It was here that the Romans built another of their Shore Forts. Later the area became part of the estate of the Anglo-Saxon King of Kent. A Saxon church was built and the Roman fort turned into a monastery. By the Middle Ages Reculver had become a thriving sea port but then the seaway which formed the Isle of Thanet began to silt up, and erosion of the coastline followed. The church, because it was about to fall into the sea was pulled down, but the twin towers were saved because they acted as a ‘marker’ for shipping. Sea defences have now saved them from destruction. 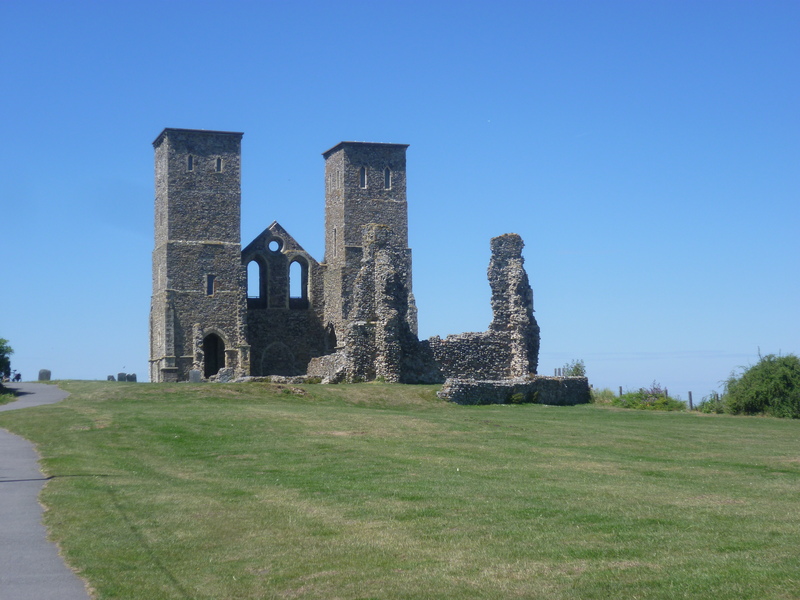 The thriving township of the Middle Ages has long gone and all that is left at Reculver is a mobile home park and some lovely walks along the coastal path.